My newest pattern is included in Interweave's premiere issue of Jane Austen Knits. It is called Miss Bennet's Beaded Bag, and it is a beaded lace hand bag. I lined the bag with silk, and used velvet ribbons for the handles. 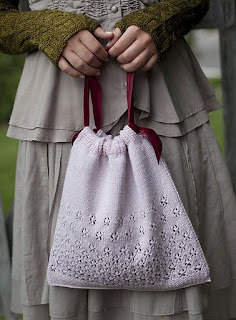 I would love to knit a second one and use d-shaped handles instead, just for a little variation. The issue will be available in stores ﻿in early November. With 35 knitting patterns, and several in-depth articles about knitting, fabric, and fashion in Regency England, there is a lot for any Austen-ite to soak in. I am honored to be included in the issue. 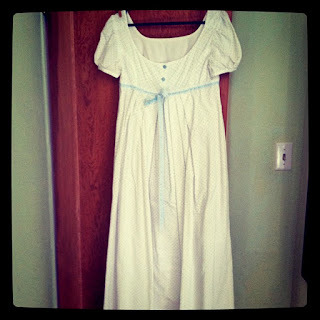 I also had the opportunity to do an interview for Jane Austen Knits with Jennie Chancey, who designs beautiful period-correct dresses for her indie pattern line, Sense and Sensibility Pattern Company. I sewed a Regency Gown from her pattern a few years ago and it is my favorite sewing project of all time! 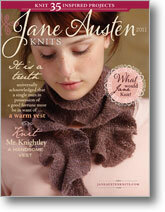 ﻿I was on hand for the Jane Austen Knits photo shoot, which was a great experience. Between thunderstorms, fetching ribbons, organizing garments, and ironing linens, I had time to snap a few shots behind the scenes. Christa Tippmann, the photographer, did an amazing job capturing the sensibilty of this publication. This garden was just gorgeous! The photo shoot sure was fun! I was so thankful you were there to help out with all the details. Welcome! 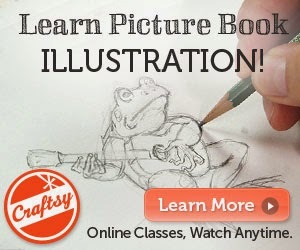 So glad to hear that you are enjoying this blog and our little tellings of our creative life. I have heard of many knitters who are making the Little House Shawl as a prayer shawl which I think is wonderful! We are in our first blizzard of the season and enjoying it very much. Happiness and health to you and yours!